2019 promises to be yet another big year for CDOs and other executives with experience in digital transformation, implementing data-driven culture, and a deep understanding of cybersecurity. The war for talent continues, especially in the C-suite. Look no further than the leadership crisis unfolding at Private Equity firms and their portfolio companies, where executives are expected to hit the ground running to manage turnarounds, succession planning, change management, and to identify and deliver new products and revenue streams in an increasingly competitive and disruptive business environment. Hence the importance of experienced CDOs to PE groups such as Bain Capital, Carlyle Group, Providence Equity Partners, KKR, Apollo Global, Blackstone, and their portfolio companies. According to a recent report by Hunt-Scanlon, "the PE sector can expect to see an expanding bidding war for top talent over the next decade. Driving the trend: persistent global talent shortages across the C-suite in most industries and functions, including finance, healthcare, biotech, digital, and technology. Value creation for PE firms is no longer beholden to financial engineering. Instead, returns are best maximized by building top flight management teams to drive revenue, find operating efficiencies and transform culture. Leadership is the new bottom line for PE operating executives seeking top talent for their portfolio businesses." Our goal at the CDO Club is is to help our members prepare for these important positions. For example, check out the report we co-published with Bain Capital on "101 CDOs Who Have Become CEO," below. In 2018, Bain Capital and the CDO Club co-published a report on '101 CDOs Who Have Become CEO,' which listed 101 Chief Digital Officers and Chief Data Officers who have become Chief Executive Officer or President since 2011. The phenomenon is occurring globally, across sectors, and at organizations of all sizes. 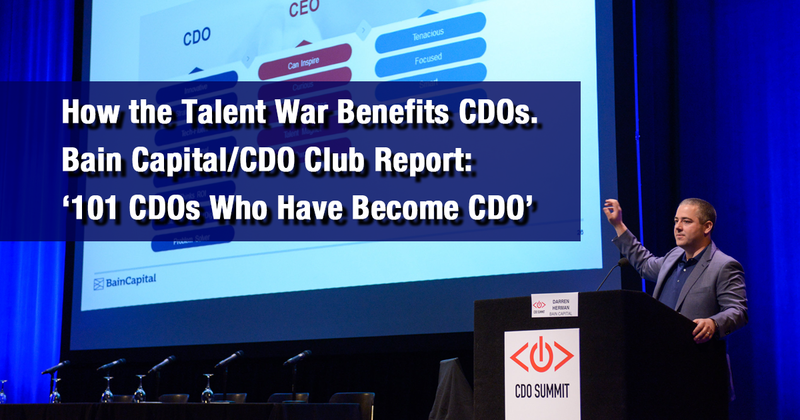 "The increase in the number of digital and data leaders taking the CEO role demonstrates the critical importance of having seasoned online veterans at the helm of organizations today," said David Mathison, CEO of the CDO Club. "The CDO Club congratulates those who have made this transition, and we continue to provide resources to help others gain the skills, connections, and training required to do the same." The CDO Club is the only organization tracking this important trend. The CDO Summit regularly includes this topic in their programming, in our efforts to prepare CDOs who want to lead the way. Danny Bass: CEO, IPG Mediabrands Australia. Former CDO, GroupM. Jonathan Becher: Co-President, Sharks Sports & Entertainment. Former CDO, SAP. Ganesh Bell: President, Uptake. Former CDO, GE. Simon Bligh: CEO, Dun & Bradstreet (now illion ANZ). Former Chief Data Officer, Veda. Nicola Brandolese: President, Retail at Luxottica Group. Former CDO, Luxottica Group. Adam Brotman: President and Chief Experience Officer, J. Crew. Former CDO, Starbucks Coffee Co.
David Chivers: President & Publisher, Register Media. Former CDO, Jostens. Kevin Conroy: President, Digital & New Platforms at Metro-Goldwyn-Mayer, Inc. Former Chief Strategy & Data Officer and President, Enterprise Development at Univision Communications Inc.
Jason Goldberger: CEO and President, Blue Nile. Former CDO, Target. Barbara Goodstein: President & CEO, TIGER 21. Former CDO, AXA Equitable. Peter Harmer: CEO of Insurance Australia Group. Former CDO, IAG. Jim Lanzone: CEO of CBS Interactive & CDO, CBS Corp.
Laura Lee: Former President and CDO, Margaritaville Media. Donald Lim: CEO at Dentsu Aegis Network Philippines. Former CDO, ABS-CBN Corporation. Pete Longo: CEO US Media, IDG and CDO, IDG. Jonathan Lu: Former CEO, Alibaba Group. Former Chief Data Officer, Alibaba. Jim Mullen: Former CEO and CDO, Ladbrokes Coral Group. Jean-Briac Perrette: CEO, Discovery Networks Intl, Discovery Communications. Former CDO, Discovery Communications. Mark Read: Global CEO, Wunderman; COO, WPP. Former CDO, WPP Group. Charlie Redmayne: CEO, HarperCollins UK. Former CDO & EVP, HarperCollins Publishing. Liz Schimel: President, Conde Nast China. Former CDO, Meredith Corp.
Andy Schuon: President, LiveXLive Media. Former CDO, Ticketmaster/Live Nation. Robin Thurston: CEO, Helix. Former CDO, Under Armour. Stephen J. van Rooyen: CEO, UK & ROI at Sky. Chief Marketing & Digital Officer, Sky. Sarah Wilkinson: CEO, NHS Digital. Former Chief Digital, Data and Technology Officer at UK Home Office.